Below you'll find some cool Dinosaur party games for your kids birthday party. If you have not looked at our Dinosaur Birthday party ideas have a look at those ideas too! There you will find lots of Dinosaur birthday party ideas for decorations, invitations, food ideas and much more. But now scroll down and check out our cool Dinosaur party games. Hot Dino Egg: Similar to Hot Potato, but played with a big fake dinosaur egg. 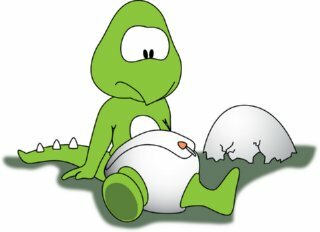 Let the kids sit in a circle, the kid who starts the game has to throw the hot dinosaur egg to a player of her choice, and then close her eyes and turn around, so she can't know who has the dinosaur egg. The players must then toss the hot dinosaur egg around to another player quickly. After a while the person who started the game and who can't see who has the hot dinosaur egg shouts "HOT", the person who is caught holding the hot dinosaur egg is out of the game. And then the game starts again with another child starting to toss it around. The player who is left is the winner. Dino Bag Toss: Similar to bean bag tosses. Draw and cut a dinosaur face with an open mouth, out from the side of a cardboard box. Don't forget to paint the dinosaurs face. Let the children stand in a line and try to toss a bean bag into the dinosaurs mouth. Give each child 3-5 chances, the child who has most points wins. Dino Egg Hunt: Fill about 50 coloured, plastic eggs (Easter eggs) full of dinosaur treats. Each egg has something different inside: dinosaur stickers, jelly beans, etc. Each child gets a little bag with his/her name on it and then they go around and "find" the eggs you have hidden and put them in their bags. Dino Egg Relay: Divide the children into two teams. Place equal number of eggs (hard cooked, but don't tell the kids) in two shallow containers and place them 15 to 20 feet from the teams. Give each team a spoon. One at a time the children have to run to the container of eggs, pick up a an egg with the spoon, return to their group, drop the egg into the empty container and hand the spoon to the next runner. The fastest team that transfers all the dinosaurs eggs to the empty container, wins. Dino Feet Race: Before the party make dinosaur feet out of boxes, be creative and paint the boxes green. The day of the party divide the kids into two teams, have the first player of each team stand with their dinosaur feet. The first player of each team must run as fast as possible to the finish line, step out of their dinosaur feet and then run back to the starting line with their dinosaur feet and pass them to the next player in line. Fastest team wins. Break Dino's Egg: Tie a balloon to each child's ankles. The kids have to try to break each others dinosaur eggs (balloons) and protect their own from being broken. The last kid standing with his/her dinosaur egg wins the game. I hope our Dinosaur party games will help you in your birthday planning and I hope your kid will love the games as much as we do. If you have great Dinosaur party games, don't forget to Party It Forward. Share your ideas with us! We and others will love to hear from you. It's nice when parents contribute in helping other parents like you, to find Free Dinosaur party games.